This year’s water activities programme is now ready to go, with RYA Sailing Courses, British Rowing courses and open boating for all to join in with. All courses based on national governing body standards and taught by qualified instructors, leading to formal qualifications as well as Scout badges. Stage 1 – A basic understanding of how a boat sailing, with some experience of steering and handling the boat. 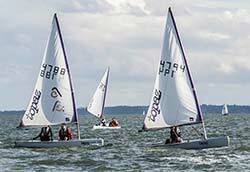 Stage 2 – A range of sailing skills and knowledge to help in becoming a confident sailor. Stage 3 – Rigging, launching and sailing in any direction. Stage 4 – Sail a double handed boat as crew or helm, and solve a variety of problems afloat. Seamanship Skills – How to handle a boat in all circumstances and solve problems afloat. Rowing courses give a good introduction to the water and are run to British Rowing Association standards. Learn to Row Stage 1 / The Pulling Badge will take you through the basics of rowing technique, both on and off the water, as well as basic navigation and safety.